In a gardening class this weekend, the discussion turned to growing tomatoes and the prevalence of the tomato hornworm. Truth be told, I have not, in the last two decades seen a hornworm on my tomatoes. Maybe I just don’t see them, but I sure don’t see any leaves eaten either. Here’s what I do to avoid them (and other pests). Borage, a lovely purple flowered herb, can be grown with the tomato plants and keeps hornworms away. I also plant marigolds in the vicinity (to ward off root knot nematodes that can devastate tomatoes), and basil. Not only do the tomatoes have company, but I get lovely flowers, cucumber-tasting borage leaves for salads, and fragrant basil. I also don’t plant tomatoes in the same garden space two years in a row. In fact, I’m on a 3-4 year rotation. The practice of companion planting can produce more food for the space than just planting recommended spacing of mono-crops. I’m a big fan of companion planting over and above any pest control benefits. Companion plants are those that help each other, and sometimes even increase yields for each other. Friends helping friends. A good companion planting with strawberries is spinach. They both like more acidic soil. Carrots go well, when planted among tomatoes late in the summer/early in the fall, when the tomatoes shade them from the hot sun, yet let them get a start. The carrots use the under-surface growing horizon and are ready to burst forth when the tomatoes are done for the season. Two crops from the same space. Potatoes and beans (particularly bush beans) go well together. They protect each other from Colorado potato beetle and Mexican bean beetle. Okra and peppers do well together, especially if the okra is used as a windbreak for the peppers. And if you’re growing lettuce and have problems with rabbits helping themselves, I’m told that onions planted with the lettuce will repel the rabbits. And while I’m on the subject….how about planting lots of rosemary? It helps repel mosquitoes! I advocate rosemary plantings around the deck or patio. Other repellents or remedies include pepper flakes and orange peels. Posted in companion planting, garden, gardening, pest control. 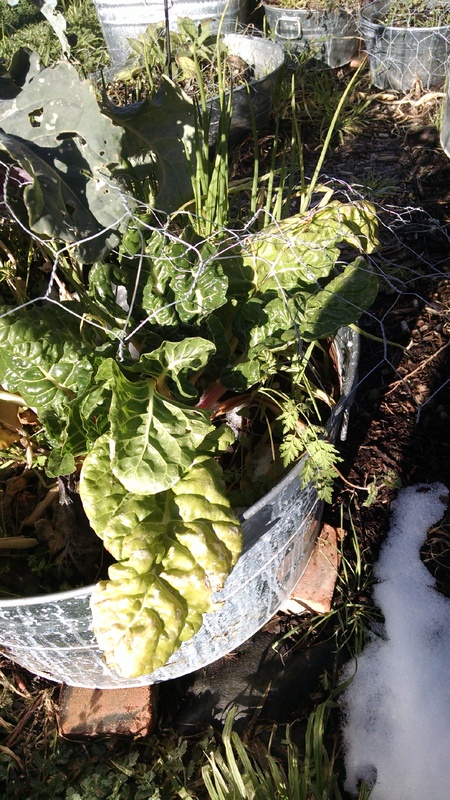 Garden Uses Simple Method of Rainwater Capture; Chard Loves the Snow! One of the challenges of small community gardens can be the cost of bringing water to the property. If the garden is on a vacant lot, then there is no large building from which to gather rainwater. What to do? But there is a solution, and one garden in Dallas, the Divinekinship Community Garden, is serving as the model. 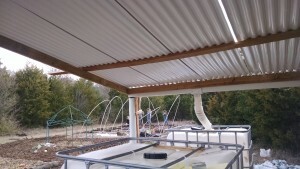 They have constructed a roof on poles – I call it a rainwater capture shelter. 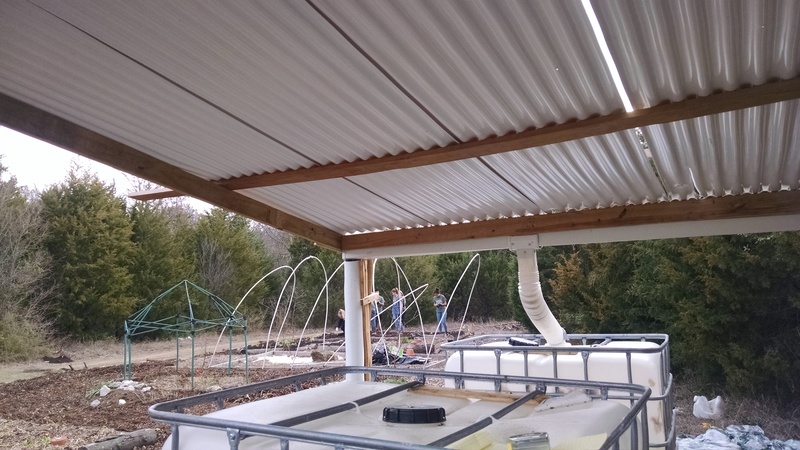 More specifically, it is a roofed, open sided structure approximately 8-9 ft. square, supported with 8’ landscape timbers at the corners (buried about 18” into the ground for stability), with a plastic/fiberglass corrugated roof. 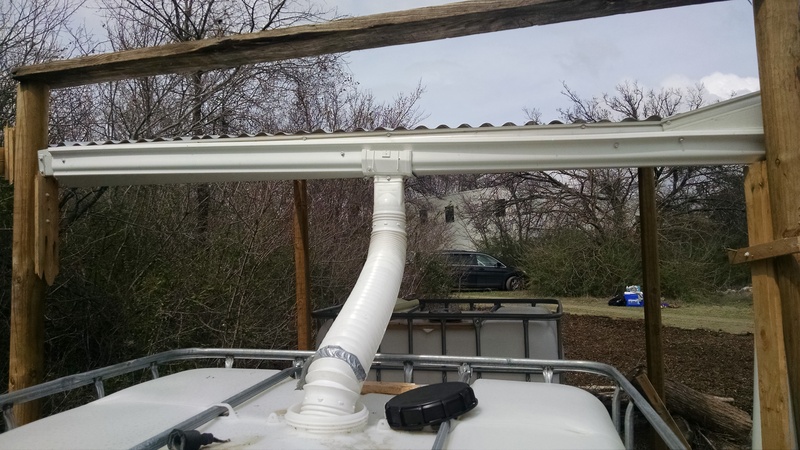 The roof is approximately 6 ½ feet high at one end of the structure, and approximately 6 feet high at the other end, so there is a slight slope down to a gutter, which feeds via a flex-spout into an IBC tote. 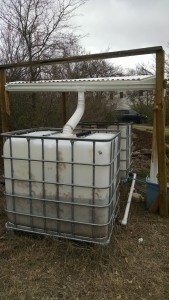 The IBC tote is connected to a second IBC tote for overflow. An estimate of the rainfall harvesting capacity is: 9’ x 9’ = 81 sq. ft. of roof. x .6 gallons/sq ft/inch of rain = 486 gallons captured in 1” rainfall. The total cost, exclusive of IBC totes, is approximately $100-$110, if materials are new. Here are some pictures of the setup. If materials can be scrounged someplace, the cost goes down. The drought conditions in the Dallas/Fort Worth area continue. And some communities may be facing more severe water restrictions this summer. A check with the National Weather Service revealed that we received 21.32 inches of rain in 2014. In 2013, the annual rainfall was 29.4 inches; in 2012, it was 31.26 inches. Even if there is another water source for the garden, capturing rainfall has the potential to cut the water bill substantially. And there’s another way to reduce water usage: Mulch. Heavy use of mulch as well as working lots of organic matter into the beds will help reduce the water needs of the growing beds. 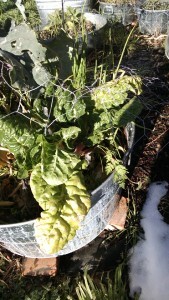 My chard came through the recent freezes and snow with flying colors. Almost as if it energized the plant. Love chard. Posted in chard, garden, mulch, rain harvest.